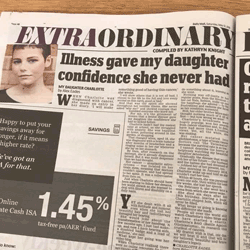 Charlotte always wanted to appear in the Daily Mail – and so she did. Extraordinary Lives is a weekly feature that appears every Saturday in which family and friends tell the newspaper about what made their loved one so special. We were delighted that Charlotte was the lead story in the feature on May 12, and also appeared on the mailonline website. mailonline is one of the largest news websites in the world, and the print edition of the newspaper sells 1.34m copies every day.